Cordons allow you to grow a useful amount of fruit in even a small garden. Cordon training is suitable for all apples and pears that bear fruit on short sideshoots (spur-bearing). Cordon training is suitable for all pears and apples that bear fruit on short sideshoots (spur-bearing). The term 'cordon' simply refers to a single stem with short sideshoots (the fruiting spurs). This is usually trained angled to 45 degrees (oblique cordon), but can be trained singly vertically (sold under a variety of names such as Minarette®) or horizontally (stepover). Alternatively, they can be trained as multiple vertical 'U' or double 'U' cordons. Angled (oblique) cordons are more productive and less prone to getting out of hand than vertical cordons. They are trained against a wall, fence or on wires between free-standing posts. Unfortunately, vigorous cultivars are difficult to keep within bounds so make poor cordons. Likewise, cultivars that bear fruit at the tips of their branches (tip-bearing) are difficult to train in this way as the tips need to be pruned off and so little fruit is borne. Those apples and pears that bear fruit on both tips and side shoots, known as partial tip-bearers, can be grown as cordons if some short branches are left unpruned each year. For example ‘Discovery’ and ‘Charles Ross’ can be successfully gown as cordons. Others such as ‘Worcester Pearmain’, ‘Bramley's Seedling’ and ‘Cornish Gilliflower’ are less successful. Choose an open, sheltered position, avoiding frost-prone sites, if possible. Soils should be well-drained, moisture-retentive and not prone to waterlogging. The best time for planting cordons is in winter. Use one-, two- or three-year-old cordons. When buying cordons, you will have a choice of rootstocks. Use M27 rootstock (extremely dwarfing) or M9 rootstock (very dwarfing) for apples where the soil is fertile; otherwise, use M26 rootstock (dwarfing). Pears are best grafted on Quince C or, for very poor soils, Quince A. If in doubt, use a more dwarfing rootstock as it is always possible to boost vigour with watering, feeding and mulching if required. Cordons need a permanent support system made up of three horizontal wires 60cm (2ft) apart with the lowest wire 30cm (1ft) from the ground. If planting against a wall or fence, fix the wire using straining eye bolts that will let the wire be fixed not less than 10cm (4in) away from the structure to allow for air circulation. Keep the wire taught with straining bolts available from fencing suppliers. Use a sturdy 2.5mm, gage 12 galvanised wire. If using posts, the posts should protrude 1.8m (6ft) from the ground with about 60cm (2ft) below ground, spaced 2.2-3.5m (7-12ft) apart. The end post should be strutted. Fix bamboo canes diagonally to the wires for the trees to be trained on. Plant trees at an angle of 45 degrees. If planting more than one cordon, space at 60-90cm (2-3ft) apart. The wider spacing within the row is for infertile, shallow or sandy soils. Tie the cordon to the diagonal bamboo cane fixed to the wire support with a soft string. Cordons can be allowed to reach a height of about 1.5-2m (5-6½ft) so take that into consideration when planting. After planting, cut back all laterals (side shoots) longer than 10cm (4in) to three buds, leaving the leader and any short laterals unpruned. Vertical and double cordons (‘U’-shaped) can also be grown in containers (at least 45cm (18in) wide) in John Innes No. 3 compost (a soil-based potting media that is easy to manage and heavy enough for the pot to be stable). 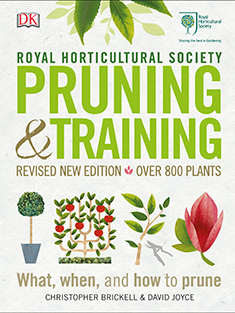 Summer pruning is carried out in August, or in areas where growth is strong, such as wet parts of the country, delay summer pruning until September when a large terminal (end) bud has formed at branch tips and the tree has stopped growing. Growing the trees as vertical double (‘U’) or four-armed (double ‘U’) cordons may be a compromise as they are still ‘space saving’, but the vertical dominance is reduced. Pre-trained trees are often available for sale. Ballerina® or ‘columnar’ apples have been bred for a columnar habit that needs no pruning other than occasional shortening of sideshoots and the leading (top) shoot. Thin out spurs in winter when congested. Ballerina® trees are convenient in small gardens or where pruning skill is uncertain. Unfortunately, Ballerinas® are reputed to have less flavour than conventional apples and are also more prone to disease. Neglected cordons: Renovate by winter pruning followed by summer pruning. If badly neglected, spread the winter rejuvenation over a couple of years. Such trees may be best replaced. Cordons can suffer from the same pest, disease and cultivation problems as standard or bush grown apples and pears however their small size makes control methods more practical.